The modern day marathon is homage to Pheidippides, who ran from Marathon to Athens, a distance of approximately 25 miles, to relay the news of the Greek victory over the Persians in 490 B.C. Upon covering such a great distance on foot and making his announcement, Pheidippides collapsed and died from exhaustion. When I started running 1.5 years ago, the thought of running a marathon at some point in my life never crossed my mind. This past Tuesday I decided that I would begin my training for a marathon. This decision came on the heels of running my first half marathon race the previous Sunday. A half marathon (13.1 miles. You’ve seen the stickers on cars) is a good distance. A half marathon is hard. Thirteen miles is a long way to run and it’s very taxing on the body and the mind. A full marathon is just insane. I won (or lost) a little bet with myself recently. I told myself if running the 3M Half Marathon didn’t kill me or make me loathe competitive running, I’d consider running a marathon. I had a blast running the 3M, so I’ve decided that I’m going to train for the Houston Marathon in January of 2016. I’ve presently decided on Houston because 1) it’s my hometown and 2) it’s a flat course. There are countless groups, clubs and trainers out there, but I’ve decided to train myself. To me, running is an individual thing that harnesses grit, willpower, physical strength, mental fortitude and humility. I have almost a year to train. My plan is to increase my weekend long run by a mile each week. I started training today with a 10-miler. My goal is to run a marathon in less than 3 hours and 15 minutes. Since we got Blue 10 days ago, the weather has been, well, crappy. It’s been cold and wet. We’re having our 6-week of Austin weather and it’s just gross outside. Because of that, there’s not much motivation to be outside. Today it warmed up a little bit, but there was still some “good” humidity, which means there was enough of a a crispness in the air to make for good running weather. And in these past 10 days, Blue hasn’t been able to “work.” She needs to run. She needs to herd. She needs a job. Maly and I took her out for a 2.5 mile run this morning at Maly’s pace. After I was finally able to take the Christmas lights off the house and put them back in the attic, and after the girls went to church, I decided to take Blue on our first run together. I’d tried last weekend and failed. We made it past two driveways and Blue saw or heard something that caused her to stop. I kept going and took her leash and collar with me. I figured teaching her how to run was going to be an involved process. 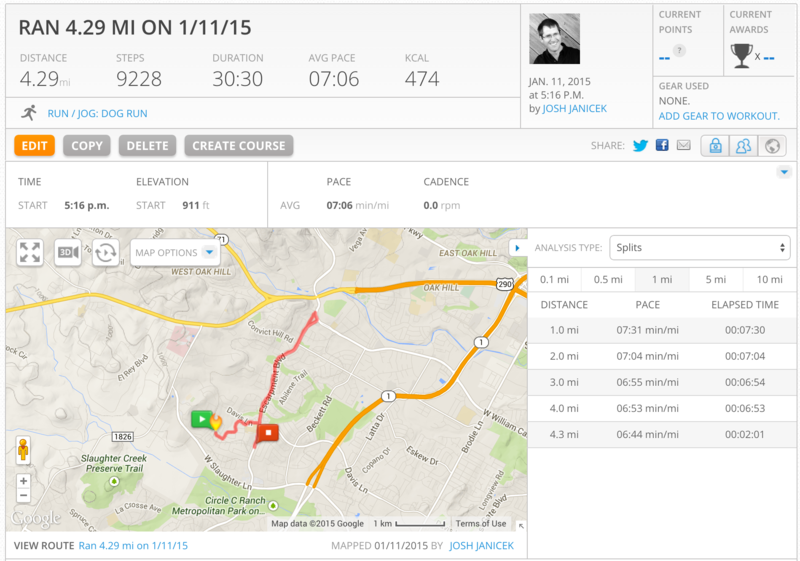 Given the luck that Maly and I had this morning, I figured I’d try her out with some mileage and at a faster pace. That dog can run. And she stayed right at my heels and didn’t trip me up once. We put in some sub-7 miles. Maybe I’ve got myself a free pacing coach.